A smokefree policy doesn’t require anyone to quit. The purpose of a smokefree policy is to protect the safety and integrity of the property and the health of all tenants, including smokers, by eliminating involuntary secondhand smoke exposure. Make the smokefree policy a provision of your lease. New and renewing tenants should be alerted to the language and required to initial the paragraphs contained in the lease regarding the new smokefree rule. Be sure to point out what the consequences for violating the smokefree policy will be and be clear that you will enforce it strictly and consistently. Tenants will be your enforcers. Your tenants want to live in a smokefree environment, so when someone does not comply with the policy it is likely you will hear from a neighbor about the violation. If another tenant reports smoking coming from a neighboring unit, resolve the issue diplomatically and in a consistent, prompt manner. Require tenants to pay for their non-compliance. Consider including in your lease provisions that, should a tenant violate your smokefree policy, the violation may result in a loss of security deposit or additional maintenance fees. Cleaning and maintenance are primary factors for adopting a smokefree policy and tenants should be held accountable if they choose not to obey the rules of the property. Please note, this recommendation is not applicable to public housing. Post signage. Signage to remind your tenants, and their guests, of your smokefree policy is extremely helpful in supporting compliance of your smokefree policy. This way, when people enter your property they are all fully aware of the rules regarding smoking in your building. Act in a timely and consistent manner when enforcing your policy. Lack of enforcement with one tenant may make it difficult to ensure compliance with other tenants. Strict, consistent enforcement of your policy will send a clear message to everyone in your building that smoking is not allowed and will not be tolerated. 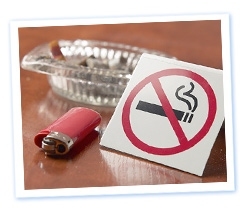 Smokefree provisions are no different than any other lease policy. Treat smoking like you would another lease violation, such as improper trash disposable, violations of the pet policy, noise complaints or property damages. The more consistent and clear you are about addressing lease violations, the better overall compliance you will have with your smokefree policy. Smoking is rarely the only lease violation. A tenant who breaks one lease condition is likely breaking others. If you come to a point where you need to evict, be sure to include all lease violations in your eviction notice, including all instances of recorded smoking violations.